Get lucky this April and get ready for some Easter surprises at SlotoCash Casino with free chips, free spins, and private freerolls! 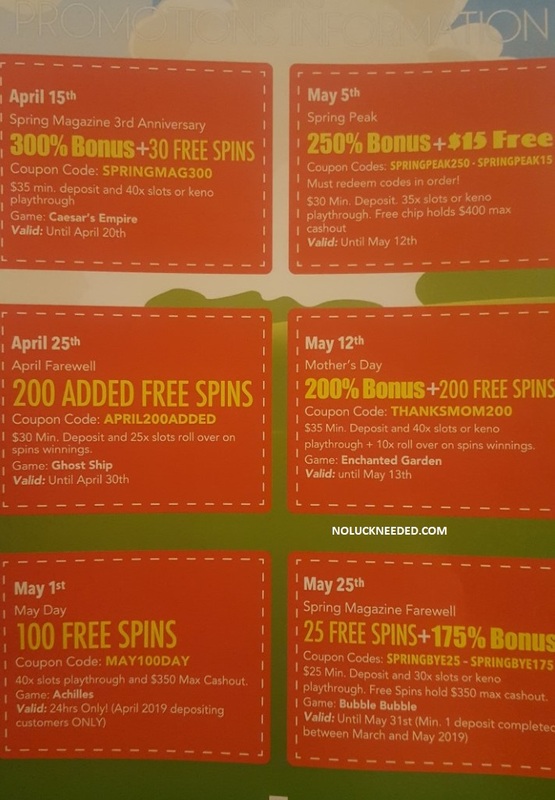 Spin the reels on the best online slots and test your luck in April with all the no deposit bonus codes coupons listed below. 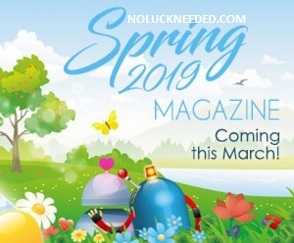 Keep an eye on this thread for the available Spring 2019 Sloto Magazine codes and Easter free chips that will be added to the list as they are released. If you find any SlotoCash no deposit coupons please share them below in the comment section. Most countries are welcome at SlotoCash, except the UK, Moldova and Israel. Good luck and have a fabulous year! IMPORTANT UPDATE 1/14/19: We regret to inform you that Slotocash Casino no longer accept Australian Players. **Existing Aussie players may still be allowed to play at SlotoCash. $31 Free Chip for New Players: Register a new SlotoCash account after clicking the banner below and claim noluckneeded.com's exclusive $31 free chip by redeeming the no deposit bonus coupon NLN31 in the casino cashier. Good luck! Make your deposit Friday or Saturday to qualify for the 100 free spins! Do not claim 2 free bonuses in a row. Standard bonus terms apply including a maximum cashout rule and wagering requirements. 40x wagering, $500 maximum cashout. Max bet rule applies. Listed in message center on 12 April 2019; Expiration time unknown, "expires Saturday". Make your deposit Monday and Thursday to qualify! Do not claim 2 free bonuses in a row. Standard bonus terms apply including a maximum cashout rule and wagering requirements. 40x wagering, $500 maximum cashout. Max bet rule applies. 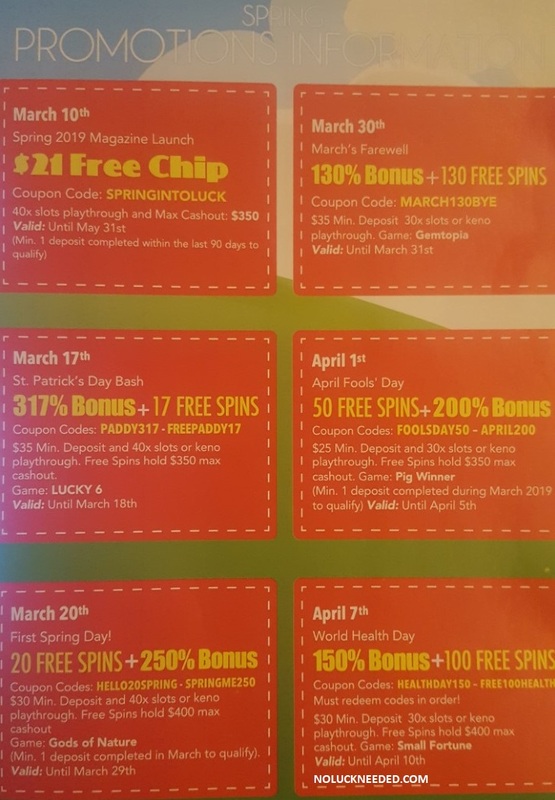 Valid 3/27/19 until? Make your deposit on Sunday to qualify for the 100 free spins! Do not claim 2 free bonuses in a row. Standard bonus terms apply including a maximum cashout rule and wagering requirements. 40x wagering, $500 maximum cashout. Max bet rule applies. Listed in message center if available; Valid on Sunday for 24 hours only. Make your deposit Friday or Saturday to qualify for the 100 free spins! Do not claim 2 free bonuses in a row. Standard bonus terms apply including a maximum cashout rule and wagering requirements. 40x wagering, $500 maximum cashout. Max bet rule applies. Listed in message center if available. Expiration date and time unknown. Give your unique coupon code from your Sloto magazine to live chat support with the answers to claim your $33 freebie. Still down from the weekend? It’s time to kick it back into gear with the Kung Fu master himself, He’s only known by the Kung Fu Rooster. It’s very rare to learn from him so come join him as he teaches how to beat the winnings from the slots. It today’s lesson he has a 200% match + 50 spins on Kung Fu Rooster, all that is required is a $30 deposit with a 30X playthrough. 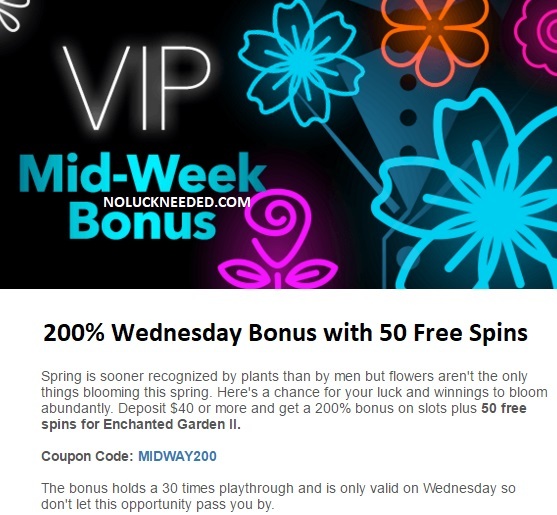 Free Spins Game: Enchanted Garden; $40 minimum deposit; Standard bonus terms apply; 30x slots or keno wagering, NO maximum cashout. Valid Wednesday only. HAPPY100LOYAL also works at Uptown Aces! If you’re the type of player who doesn't like to play with requirements attached to your deposit, or if you're feeling like playing with no bonus attached, you can choose our 35% Instant Cashback offer on any deposit you make from Monday thru Wednesday or 50% from Thursday thru Sunday! Mzmelabella, They do not have the scan promo this time! Sorry!